OK, after having my vet out who look, he couldn't find anything wrong with my horse. He didn't look closely at the feet, not his thing. !? Just in case of beginning founder (had dig pulse after 15 min riding), he cut my horse's grain. 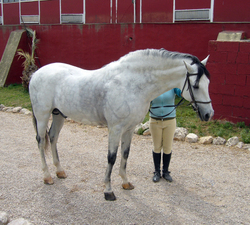 Now my poor horse has dropped weight, way too much, in two weeks. He doesn't finish his hay either, but he's a smart fellow and leaves the weeds and moldy stuff behind. I'll switch him to silage and increase his food. I've ordered supplements for feet, though is actual horn is rock hard!! AS for standing on his toes, it's been that way for so many years the vet says not to worry. Phooey with the vet, I hope the farrier can get to the bottom of this! On top of all the things I wrote in my prior post, I have noticed his frogs are small and don''t grow. He barely has them contacting the ground, even with his new boots and dome pads, which he doesn't seem to like much. There is no thick cushion to pump blood through the leg.... The frog has even tried to grow over the deep grooves in the back, over in the appearance of a healthy frog. underneath.... ewe. So... my horse has been Barefoot since November 2006 and I have treated his mild thrush with every darn product out there, and them some homemade ones, since I bought him. He hasn't had any sole or frog cut away since we found no more thrush 6 months ago. I still put treatment, on just in case. 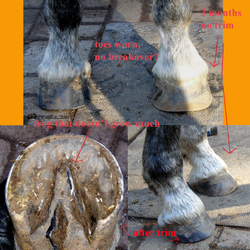 What I need to know... My farrier says she read not to trim back any sole or frog, just loose flaps. This is all we have done. However, does this mean to leave behind the white dead frog and let it fall off itself? I've left it, except when it made pockets in the groove. Isn't it OK to cut down to live frog, but not cut away the healthy frog? Granted, there seems to be no healthy frog growing in and cutting the dead stuff makes even less contact with the ground. Argh! 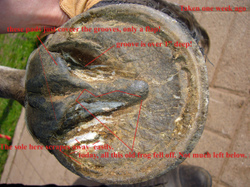 How far can/ should my farrier cut back on the frog? He needs a trim badly since I've hurt my back and can't keep up as well. His heel need cut back a lot, but will this help him or increase his pain? 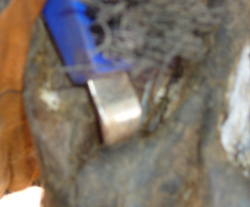 Is there anything special, but still in thee natural hoof care method, that my farrier can do? Normal farriers would cut back until thee is no more damaged frog, then go a bit more... They also scrape away the sole for some odd reason. The sole nearest the frog is white and crumbly and easily with the hoof pick. Someone had mentioned deep, deep thrush. Does this mean that thrush can also be hiding under healthy looking frog? Besides the trim, what is the best treatment for it? Topicals I can buy online don't seem to penetrate. Is there some solution that I can fill the inside of my boots with for a good soak while I ride? I've ordered Copertox, one of the solutions I haven't tried yet. After all the others, I don't hope for much. I've also heard of using Reducine as a thrush treatment. There's EquipackCS, but nothing to keep it in the hoof on a BF horse. I've put anti-bacterial soaps in my Easyboots with some water, but no luck. i'm all ears for topical solutions too! This is frustrating. If thrush IS the deep problem, is it the cause of the frog not growing? Are there any other reasons? Now for his boots... He's a short toed fellow with a size 2 boot and 1 strap. I've added thin a foam rubber insert, glued to the toe and sole area of the boot. This takes up space front to back to make the boot hold better. I have new dome pads inside, since the comfort pads are shredded and useless after 2-3 short rides. His horn is VERY sharp and hard, like steel! SO far, they have not sliced up the dome pads, but Celo has been stumbling a bit in them. These pads are placing more pressure than his comfort pads did. Good for blood flow, but causing pain? Is frog pressure or relief the key here? The pressure pads will create even better blood flow as does the dome pads, a little. The relief pads will give pain relief, but will the frog grow? I can always cut a groove in my dome pads if need be. There's here's the story.. I can't change the quality of reed, hay, and footing in his turnout. I can only add supplements (and pay dearly to have them given) and say my horse is lucky to have a giant well drained pasture in this area of Germany. HE also has a small run-in off his stall. He's ridden 3-5 times a week 1-4 hours a time. Boots are only used outside on the front. and over 3 hours for the back feet. His back feet are picture perfect, but also could use more frog and have a bit of thrush. Otherwise, horse care here is the same as passed from grandfathers and generations. Home grown oats, hay and straw are what you get. I'm blessed to find a place with daily stall cleaning.... not yearly!! Sorry about another looong post! 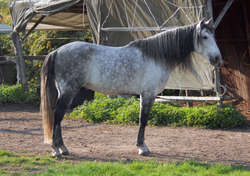 I have been looking for a new Iberian horse for several years. If anybody has traveled to Spain and seen the native PRE's feet, you'll know few are in good shape. In all the studs i've visited, the feet are long and high, like an ASB or TWH 's feet after ll the leather padding is added! (if this is still done) The heel are commonly contracted and the frogs cut so high that I've measured up to and 1 1.2 inches from shoe bottom to frog. 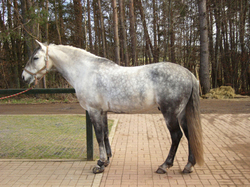 The stallions are kept standing int heir stalls 24/7 after reaching the ages of 3, except for a walker. There is no turn out, no such thing. I'm basing this on 7 studs I visited and info from friends. Two, can these feet be booted with standard easy boots with gaiters ? They are very high, and from what i've seen of my friend's 7 yr barefoot Spanish horse, they stay that way. Original Old Macs might be better, but all could end up setting on the hoof in unusual spots. Also, I like to ride very long trail rides of up to 6 hours. (the horse is very smooth) I don't think the old macs can do this! The left front foot (minus some toe) is what I'm used to seeing for god old Epics. I'd really like to know what I'm gettign into shoe wise! If this horse can stay sound his long life (how severe is this cub? 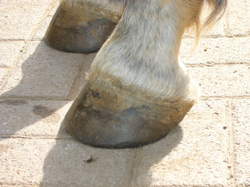 ), doe the standard BF trim and roll work on all four feet, or is there something special? Something extras needed in form of pads or care. Are long hours in the saddle going to be too much? Is there anything else I should know? 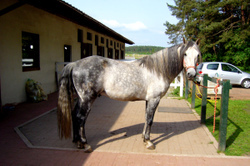 It's a long story on why a Spanish horse, but here in Europe, this fellow is the cheapest decent horse I've found. It's the dollar/ Euro that is the extra killer. Just know both my back (herniated disk) and knees are shot. for good. The Iberian is like a Rolls Royce to ride! I have Lusitano now (can't pass blood tests for the US) that I've had Epics on for 1 1/2 years, even with the back and knees making new ways to get those boots on (LOL!) and I am hooked on the BF trim and EBs!! They have given my horse a new chance in life. I'll post photos of his picture perfect feet some day. :-) SO, I hope to continue like this for all future horses. I just pulled shoes from my Foxtrotter and my Endurance Arabian as I have decided to try barefoot. I am wondering how long they are "ouchy" after shoes are pulled. I live in San Diego where we have had a lot of rain recently so I thought this might be a good time. I have a gal coming to fit easy boots in a couple of weeks. 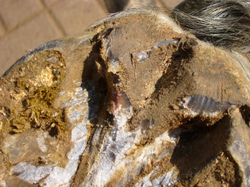 Hello, I would like to ask you natural hoof care specialist out there what would you do with this quarter crack? A friend of mine bought this small quarter horse paint that came out of New Mexico. His feet where covered with mud and she loved his disposition so much she over looked his feet?#&! Well here is a picture,it is a pretty substantial crack,but it does not go up into the coronary band. He is not lame or off. 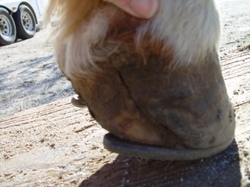 It looks to me like he had a old injury on the quarter that may have made the hoof flare out on that side. Could he go barefoot with a proper trim? 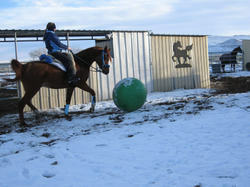 Fun in the snow ~ Lets play ball! Did someone say play ball? This is what we do for fun in NV when we have a little snow! This is what natural horsemanship is all about, having FUN and with out the nailed on "ice skates" most horses are forced to wear year round. I never have to worry anymore about sliding with all natural trimming. 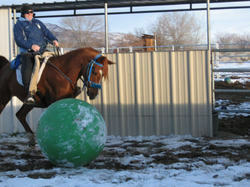 This is how our horses stay fit. We play any game we can at any time of day. This keeps their minds in shape too for those unexpected things on trail rides. Enjoy the photos. I told ya more photos to come... Hope everyone enjoys riding in the snow. I just might have to trade-in some of my Bares for Grips if we get more snow this year. Amy in the Nevada Desert.